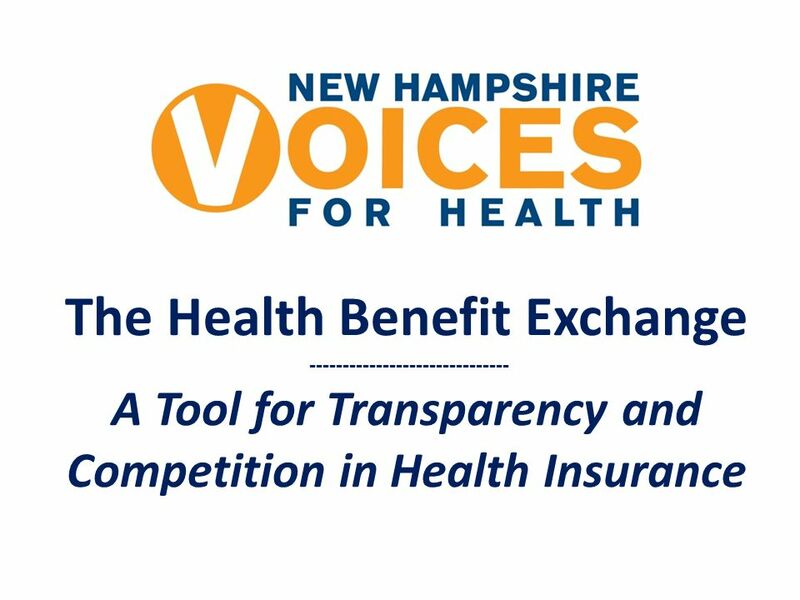 The Health Benefit Exchange ------------------------------ A Tool for Transparency and Competition in Health Insurance. 3 What is an Exchange? 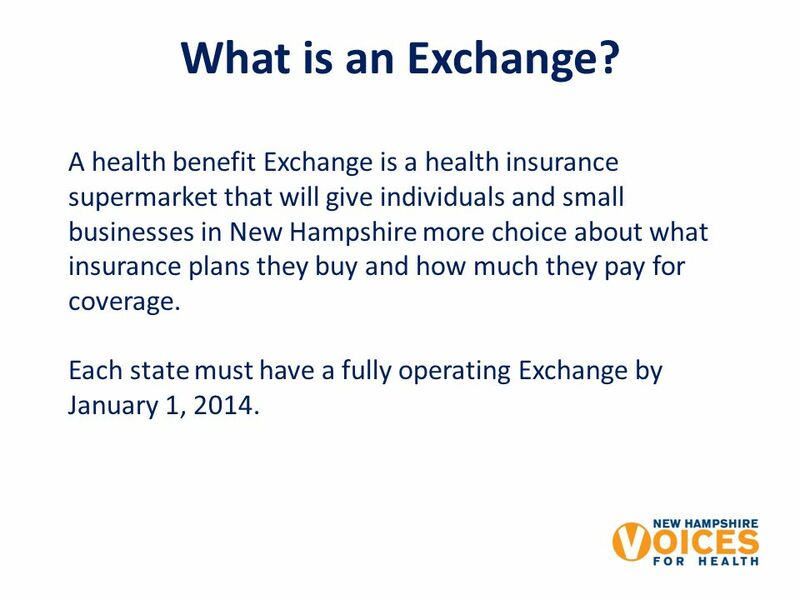 A health benefit Exchange is a health insurance supermarket that will give individuals and small businesses in New Hampshire more choice about what insurance plans they buy and how much they pay for coverage. Each state must have a fully operating Exchange by January 1, 2014. 4 Where Did the Idea Come From? 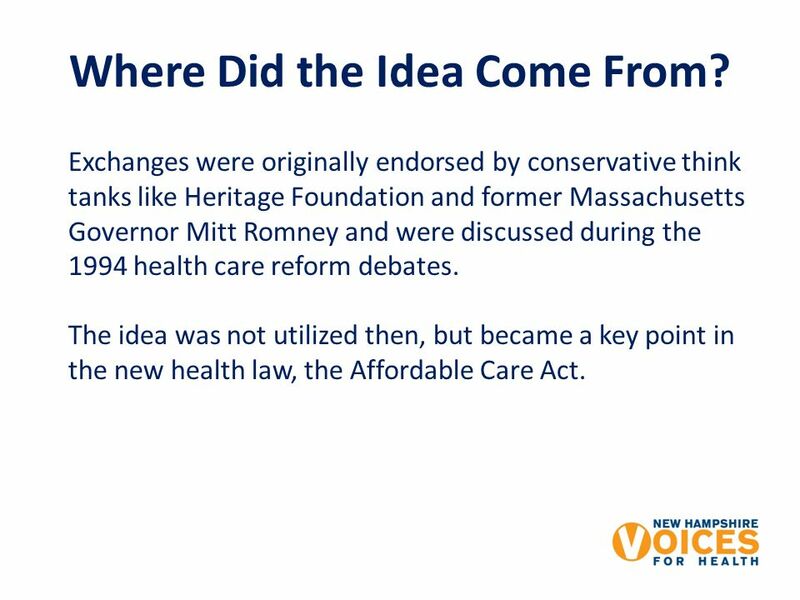 Exchanges were originally endorsed by conservative think tanks like Heritage Foundation and former Massachusetts Governor Mitt Romney and were discussed during the 1994 health care reform debates. The idea was not utilized then, but became a key point in the new health law, the Affordable Care Act. 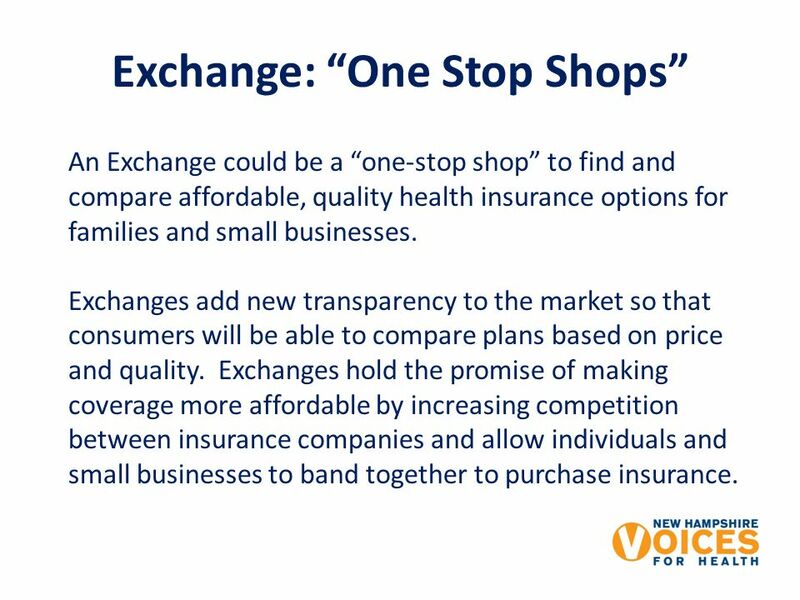 5 Exchange: One Stop Shops An Exchange could be a one-stop shop to find and compare affordable, quality health insurance options for families and small businesses. Exchanges add new transparency to the market so that consumers will be able to compare plans based on price and quality. Exchanges hold the promise of making coverage more affordable by increasing competition between insurance companies and allow individuals and small businesses to band together to purchase insurance. 6 Who Will Use It, and When? 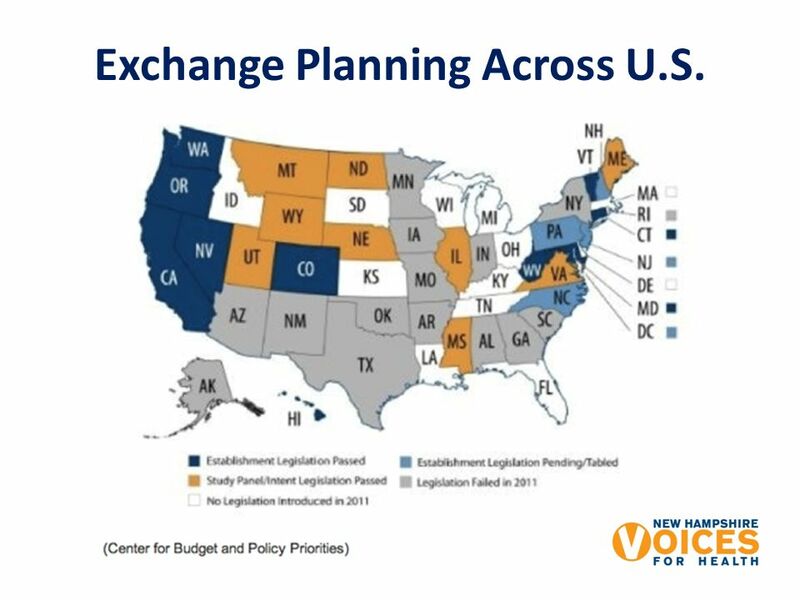 The new health law calls for each state to have a fully operational health benefit Exchange in 2014. 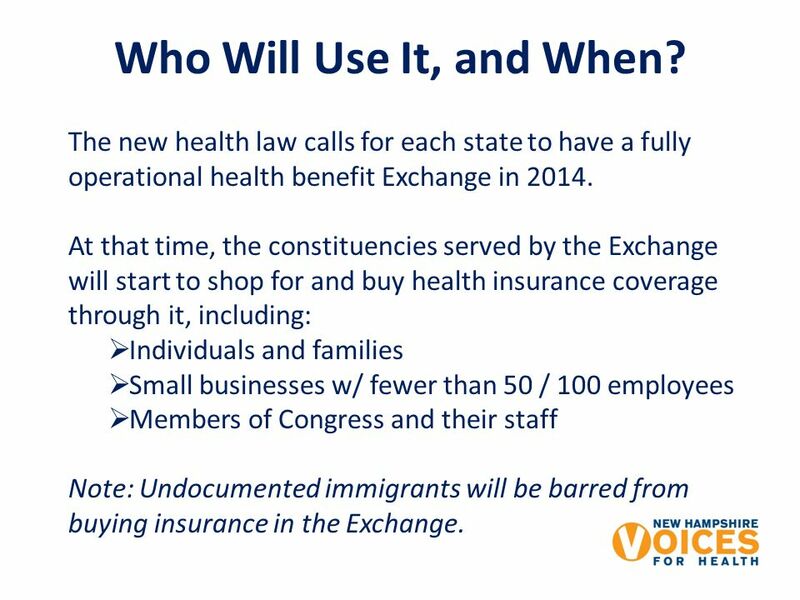 At that time, the constituencies served by the Exchange will start to shop for and buy health insurance coverage through it, including: Individuals and families Small businesses w/ fewer than 50 / 100 employees Members of Congress and their staff Note: Undocumented immigrants will be barred from buying insurance in the Exchange. 8 … and the way it will be. 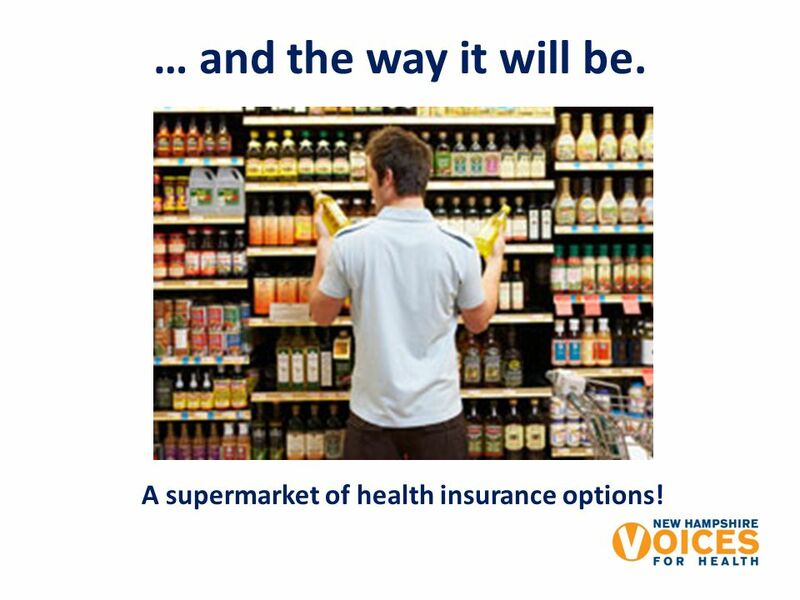 A supermarket of health insurance options! 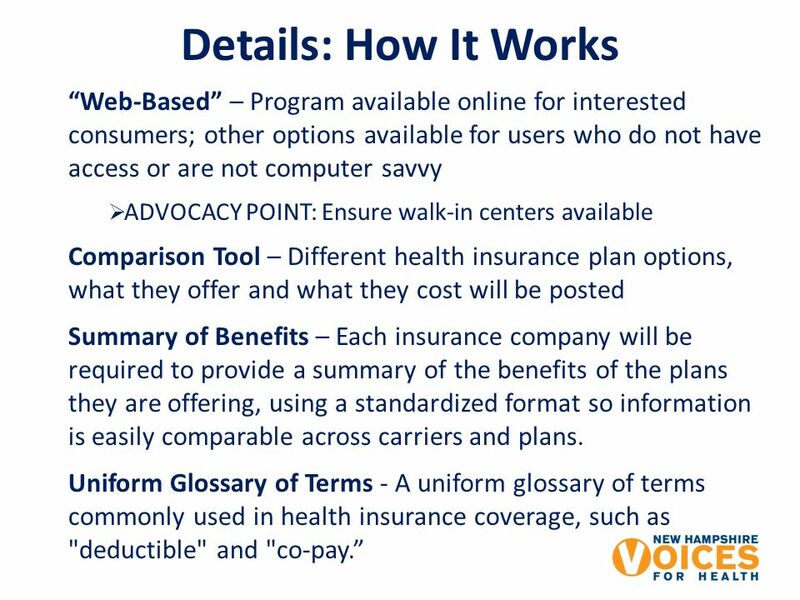 10 Details: How It Works Web-Based – Program available online for interested consumers; other options available for users who do not have access or are not computer savvy ADVOCACY POINT: Ensure walk-in centers available Comparison Tool – Different health insurance plan options, what they offer and what they cost will be posted Summary of Benefits – Each insurance company will be required to provide a summary of the benefits of the plans they are offering, using a standardized format so information is easily comparable across carriers and plans. Uniform Glossary of Terms - A uniform glossary of terms commonly used in health insurance coverage, such as "deductible" and "co-pay. 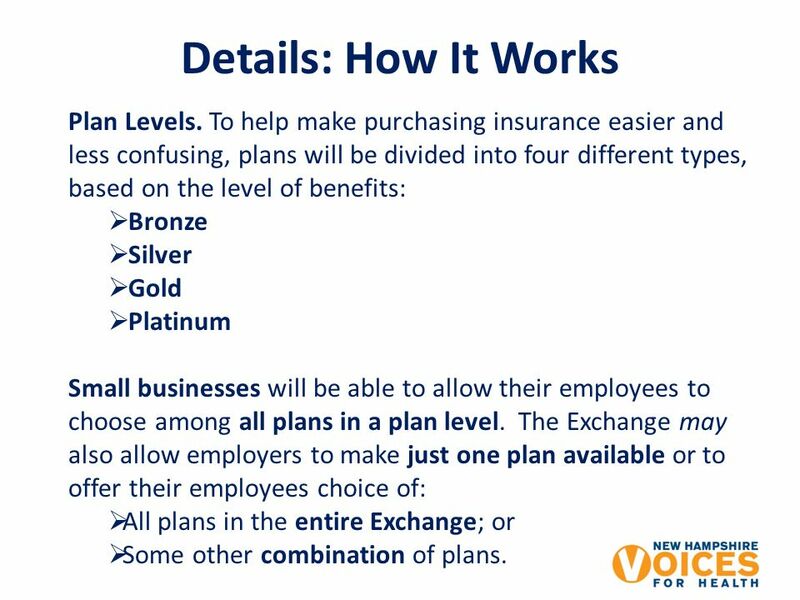 13 Details: How It Works Plan Levels. 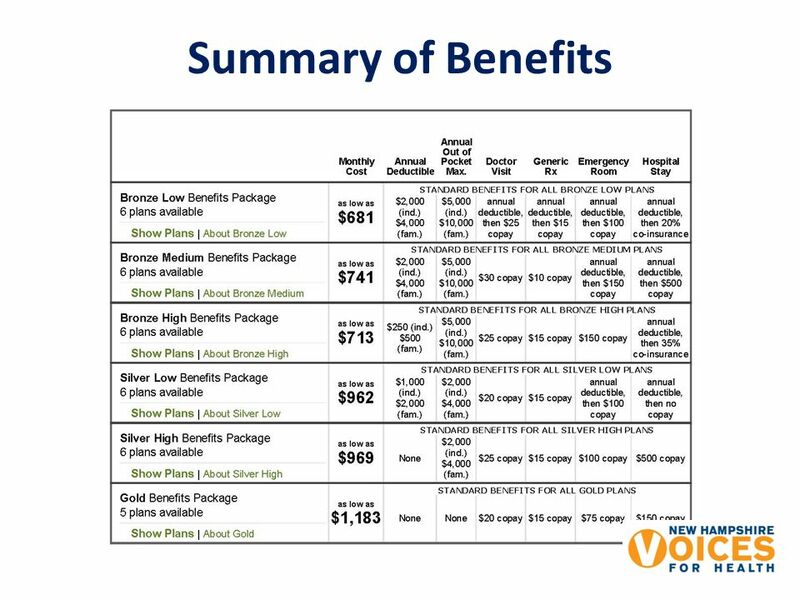 To help make purchasing insurance easier and less confusing, plans will be divided into four different types, based on the level of benefits: Bronze Silver Gold Platinum Small businesses will be able to allow their employees to choose among all plans in a plan level. The Exchange may also allow employers to make just one plan available or to offer their employees choice of: All plans in the entire Exchange; or Some other combination of plans. 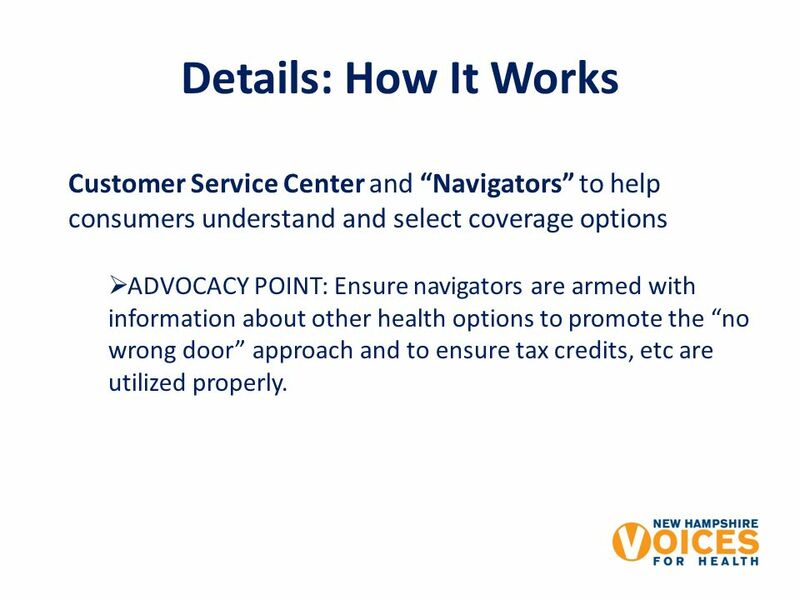 15 Customer Service Center and Navigators to help consumers understand and select coverage options ADVOCACY POINT: Ensure navigators are armed with information about other health options to promote the no wrong door approach and to ensure tax credits, etc are utilized properly. 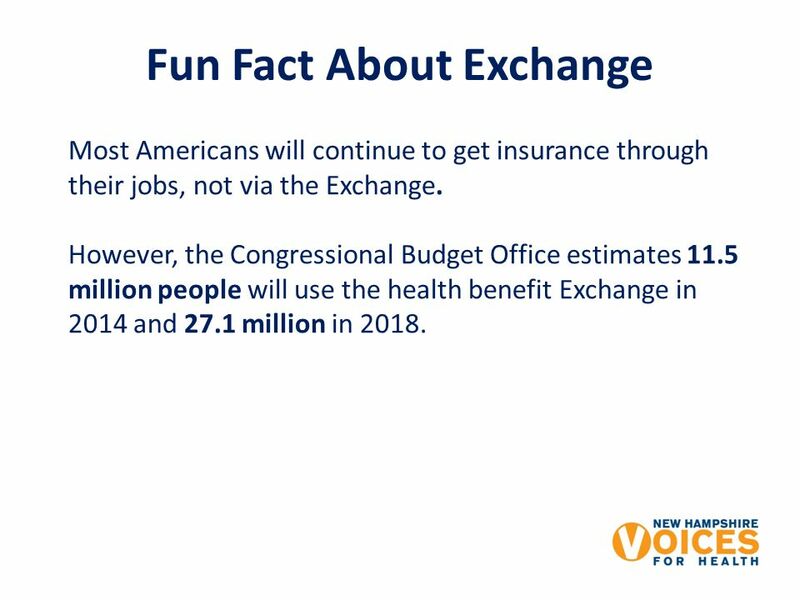 19 Fun Fact About Exchange Most Americans will continue to get insurance through their jobs, not via the Exchange. 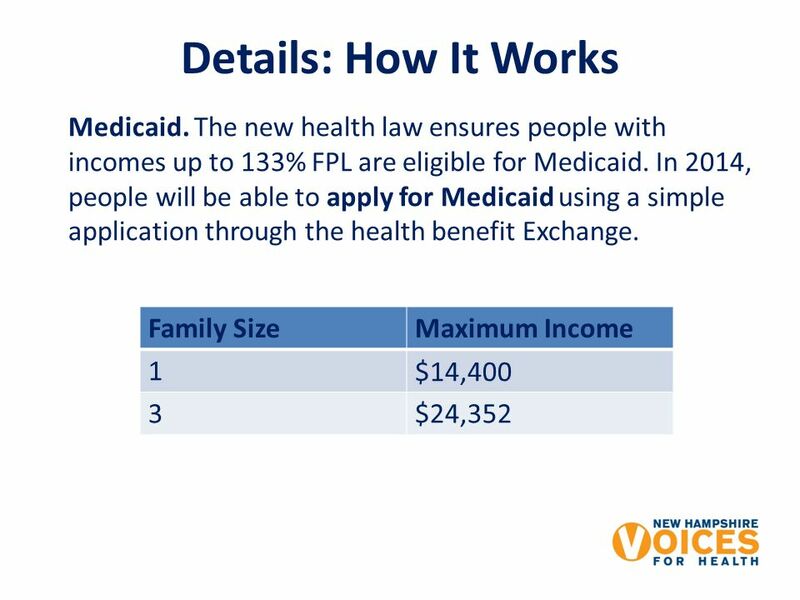 However, the Congressional Budget Office estimates 11.5 million people will use the health benefit Exchange in 2014 and 27.1 million in 2018. 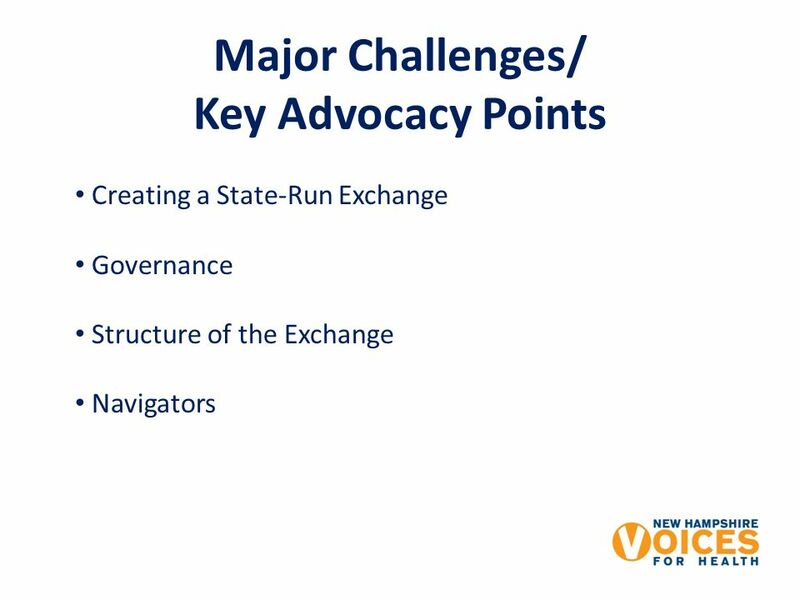 20 Making It Happen: Exchange Advocacy Locally & Nationally States can choose to operate their own exchanges or participate in a multi-state exchange. 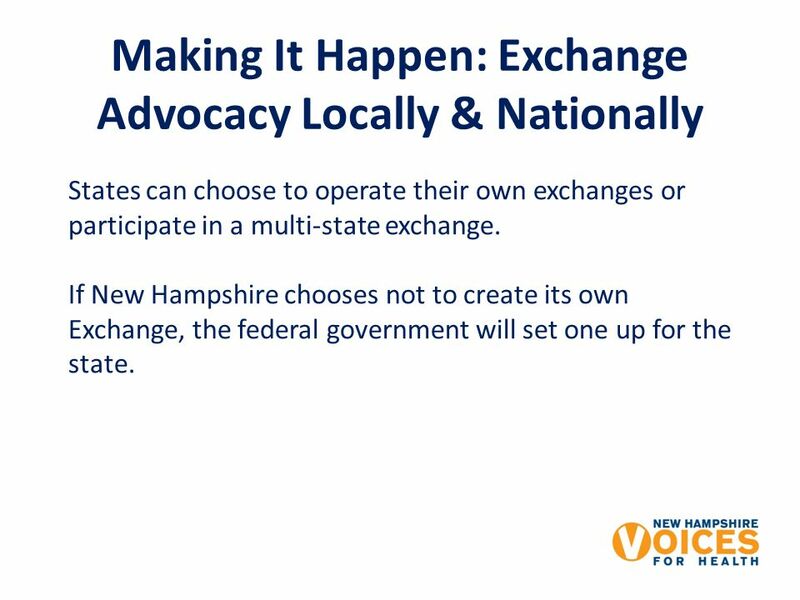 If New Hampshire chooses not to create its own Exchange, the federal government will set one up for the state. 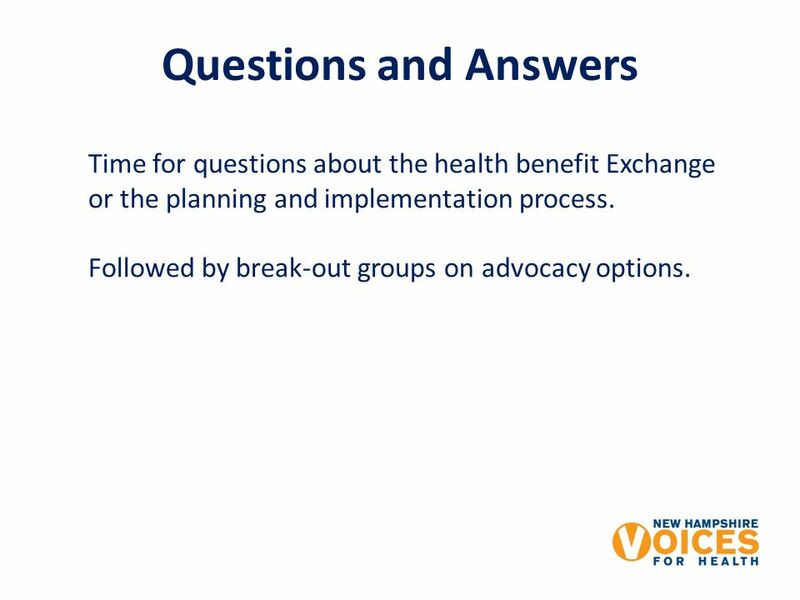 21 Exchange Planning Across U.S.
24 Questions and Answers Time for questions about the health benefit Exchange or the planning and implementation process. 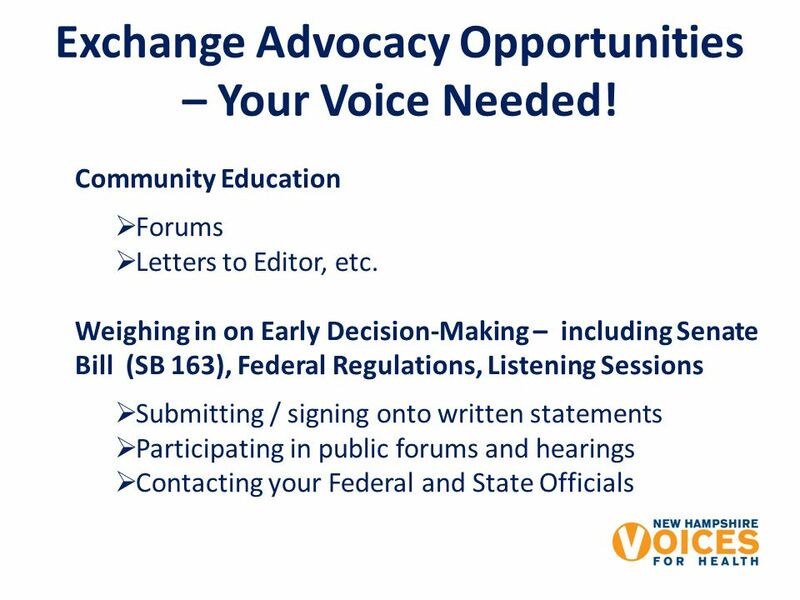 Followed by break-out groups on advocacy options. 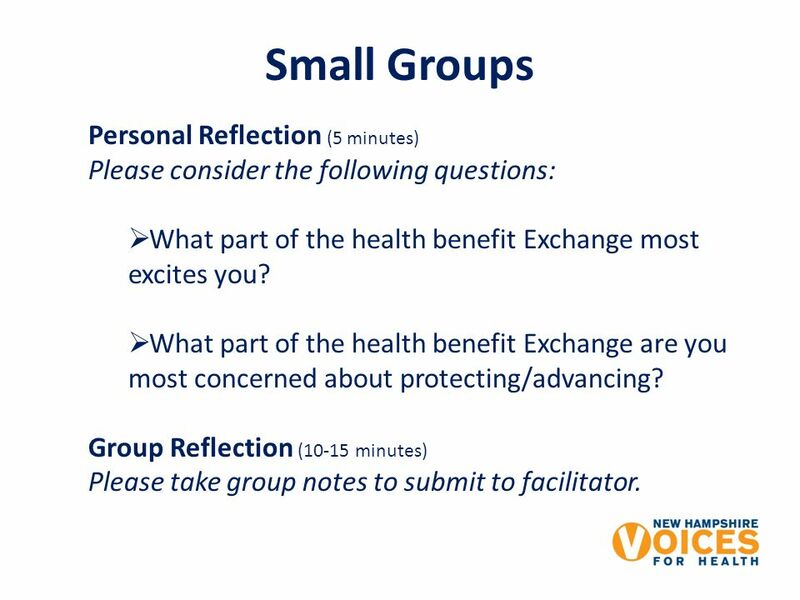 25 Small Groups Personal Reflection (5 minutes) Please consider the following questions: What part of the health benefit Exchange most excites you? 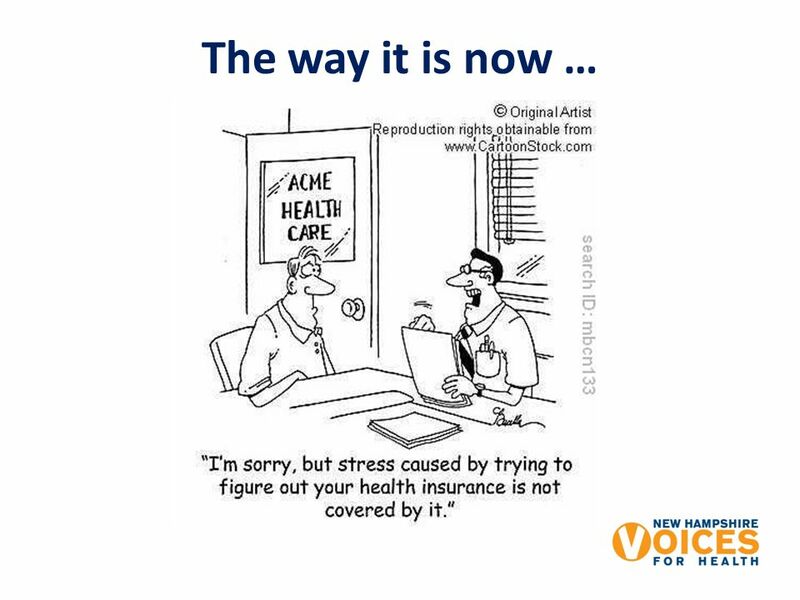 What part of the health benefit Exchange are you most concerned about protecting/advancing? Group Reflection (10-15 minutes) Please take group notes to submit to facilitator. 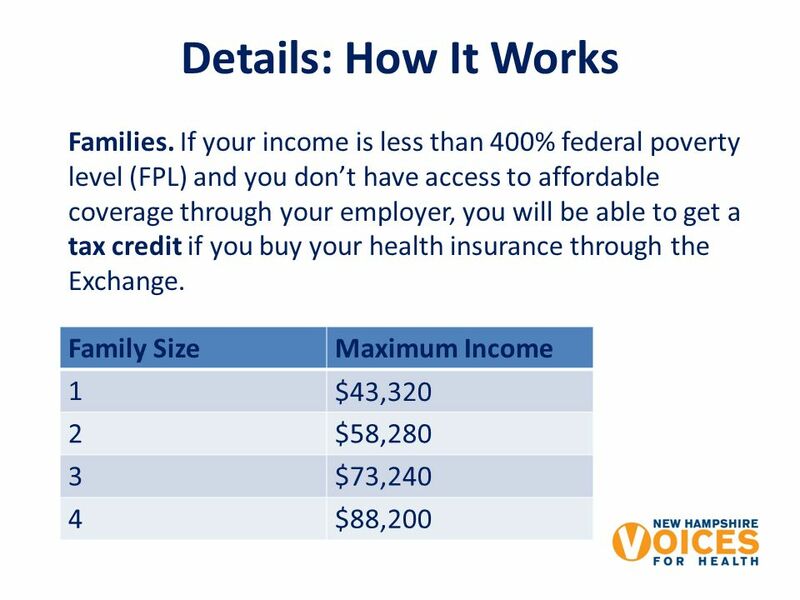 Download ppt "The Health Benefit Exchange ------------------------------ A Tool for Transparency and Competition in Health Insurance." 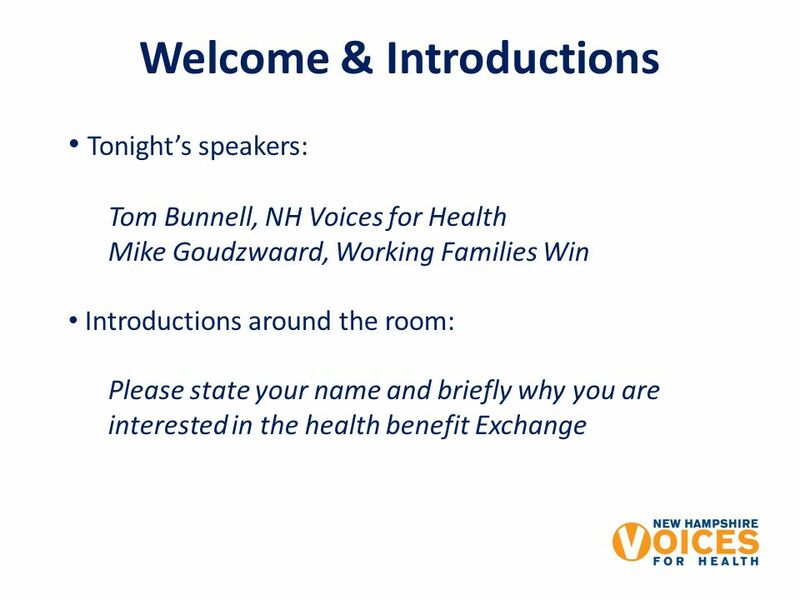 The New Health Law: What It Means for New Hampshire. 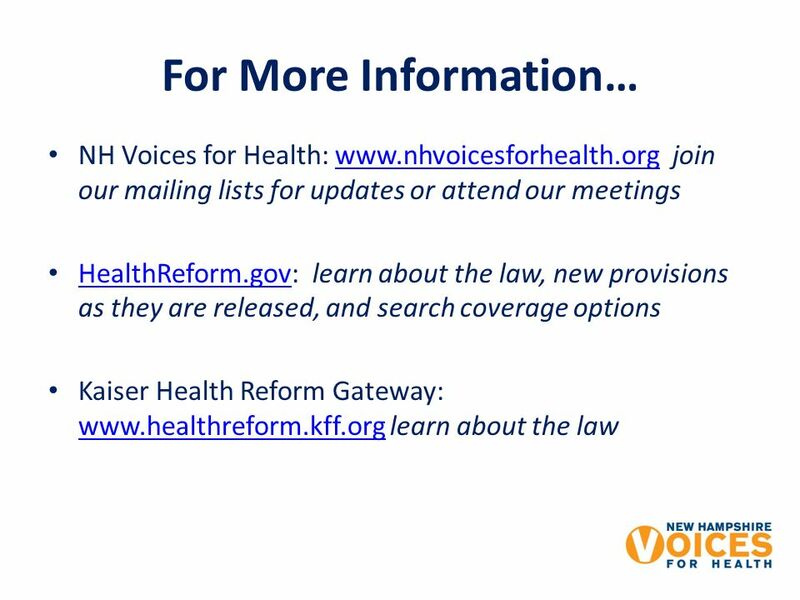 Health Care Reform: Whats in the new law? And what happens now? Presented by Amy Smoucha Health Care Organizer, Missouri Jobs with Justice. What You Need To Know About Health Care Reform. Health Care Reform Key Facts March 23, President Obama signed the Affordable Care Act. A central. QHP Training NEW MEXICO HEALTH INSURANCE EXCHANGE BeWellNM.com. Nebraska Appleseed Justice and Opportunity for All Nebraskans. 1 WHAT IT MEANS FOR YOU? April Health Access is the leading voice for health care consumers in California. Founded in 1987, Health Access is the. 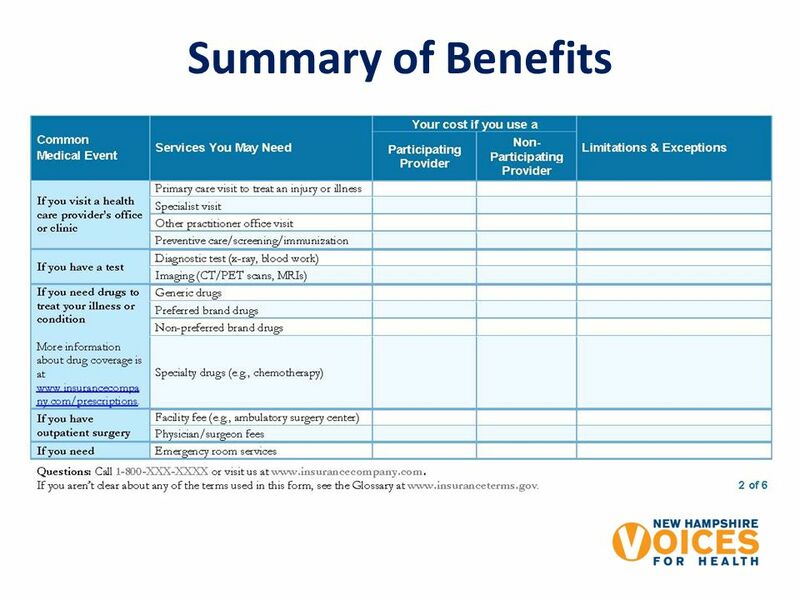 What is a health insurance exchange? 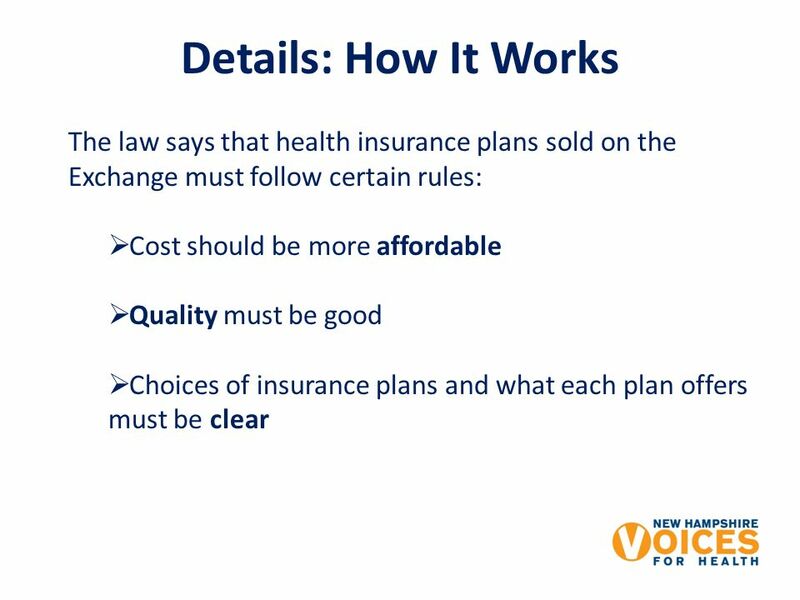 A health insurance exchange is an organized marketplace for customers to shop for health insurance based on price. The Affordable Care Act Reduces Premium Cost Growth and Increases Access to Affordable Care Before ACA, Small Employers Faced Many Obstacles to Covering. How the new law impacts your bottom line David Chase April 30, 2013 Mountain View, CA Wellness, Healthcare Reform and California Small Businesses. The SHOP Marketplace New Health Insurance Options for Small Businesses Roseanne Egan Deputy Regional Administrator August 2013. Help is on the way! 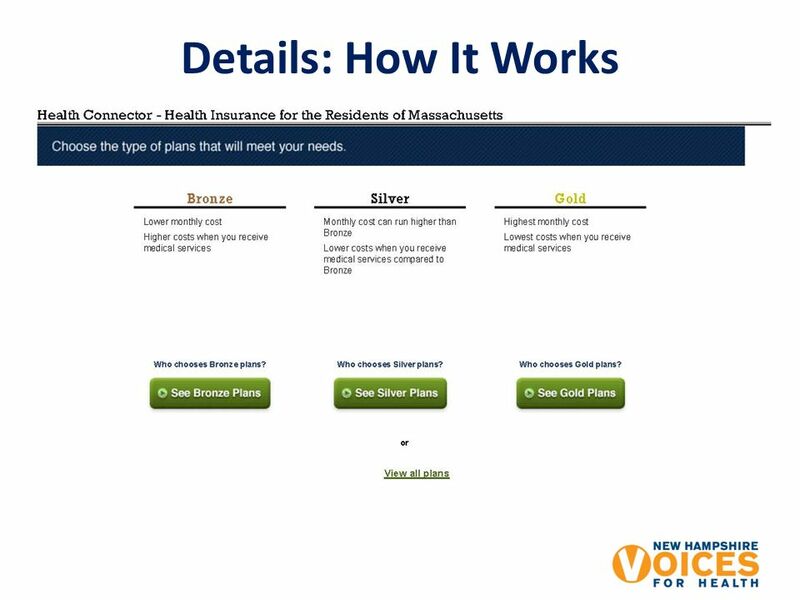 Health Care Reform: Health Plans Overview. 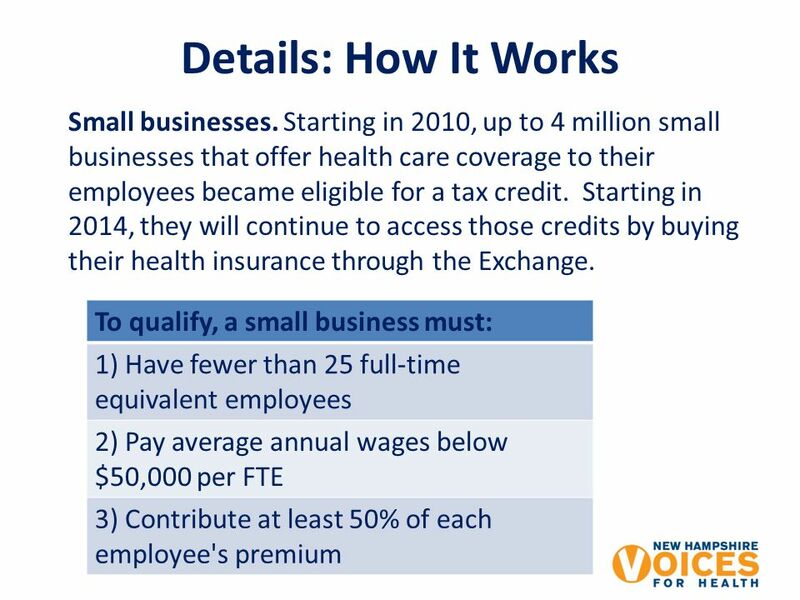 Affordable Care Act 101: What The Health Care Law Means for Small Businesses December 2013 These materials are provided for informational purposes only.